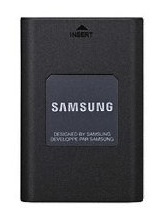 The battery of new Samsung NX200 will have a smaller size then of NX100 (NX11, NX10). Capacity will be changed: instead of 1300 mAh would be 1100 mAh (or so). The old charger is not suitable for new batteries. But it will be released universal charger for the batteries of both types. Now is not known what type of device will be put in the kit (only for new battery or for both). We have a chance that it will be a universal device.